This is a brand new book by one of Madison's own priests, Fr. RIck Heilman, founder of the Knights of Divine Mercy and pastor of St. Mary's in Pine Bluff. 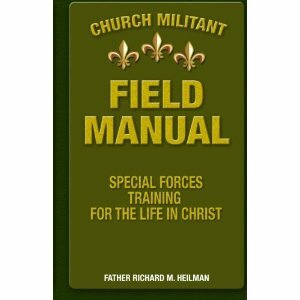 I’ve ordered my copy of Fr Rick Heilman’s brand-new book, Church Militant Field Manual: Special Forces Training for the Life in Christ, and I’m confident this will be a good book. Fr Rick is pastor of St. Ignatius Parish, Mt. Horeb, Holy Redeemer Parish, Perry, and St. Mary Parish, Pine Bluff, and founder of the Knights of Divine Mercy, where he also has a blog. 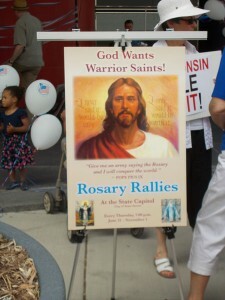 Very many people here in the Madison area have found his spiritual guidance invaluable. He’s been extremely kind and encouraging to us in collaborating on the religious freedom efforts, and spoke and led prayer at the June 8th Stand Up For Religious Freedom Rally. 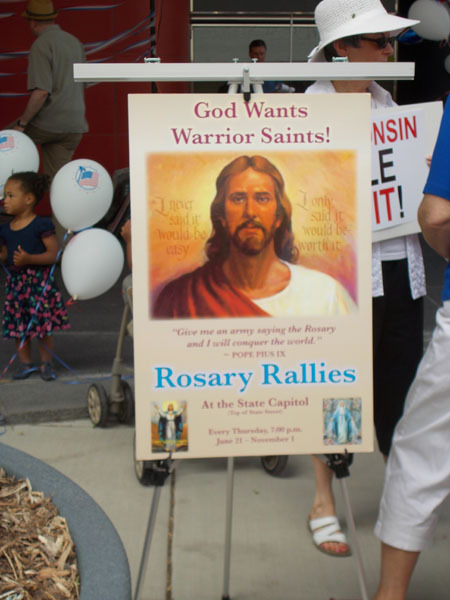 The forthcoming Thursday evening Capitol Rosary Rallies that start NEXT week are his and Fr Isaac Mary Relyea’s initiative. Fr. Richard M. Heilman is a priest for the Diocese of Madison. He is the founder of the Knights of Divine Mercy, which is an apostolate for Catholic men’s faith formation, and he is a Fourth Degree chaplain for the Knights of Columbus, chaplain for the Madison area Holy Family Homeschoolers, an advisory board member of St. Ambrose Academy, and board member of the Women’s Care Center. With his expertise in spiritual direction, Father Heilman is also a regular guest priest on Relevant Radio’s, The Inner Life. Father Heilman has a passion for the pro-life cause and is also the founder of Kneel for Life, which encourages all to draw upon God’s supernatural strength and power through prayer before all pro-life efforts. You can get this exciting book from Amazon! I understand it will also be for sale at the Rosary Rally this coming Thursday!